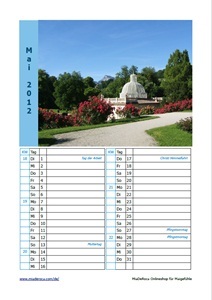 Out calendar photo for May 2012 is a wonderful bright blue sky, a blue sky over the Mirabell garden in Salzburg. For all who ever travelled to Salzburg know that we are on top of the rose hill and have a look over Mönchsberg to Untersberg, looking to Bavaria. Yes, where the blue has its deepest shade of blue we are no longer in Austria, but loook at Germany. Mirabell garden is a place where you can stroll and gaze all day long. A garden with many different corners, arranged flowers and a big fountain in the centre. When beautiful roses are blooming that is also the time where the elderflower starts to bloom. In our recipe section you can find a recipe to turn this sweet small bloom into heavenly smelling elderflower cordial. May is the time where you can still find some green, fresh wild garlic leaves and turn it into wild garlic pesto, wild garlic dumplings or in a green refreshing spread. Talking about spreads – in May picnic seasons starts and spreads are great for picnis. Either cover tramezinis with them or take the spread along to dip, we have several spreads in our recipe collection. Soon the season of home grown straberries start, in the meantime you can stitch some of the delicious red fruits on tabel cloth or bags with our cross stitch pattern strawberry. If you like to get crafty with your kids, or are looking for a quick and colourful craft project: make some pinwheels – you could even write the invitation to your next bbq or garden party on self made pin wheels. Print out your calender page for May 2012, here: May Calendar Page (pdf).